Home / featured post / VP Osinbajo Responds To Calls By Nigerians To Arrest Goodluck Jonathan. VP Osinbajo Responds To Calls By Nigerians To Arrest Goodluck Jonathan. Vice President Yemi Osinbajo has responded to calls by some Nigerians for the arrest of former President Goodluck Jonathan. Mr. Osinbajo said the Buhari administration does not arrest “anybody, anyhow”. Answering a question at a session in the United States on Friday, on when Mr. Jonathan would be arrested, Mr. Osinbajo said the Buhari administration was not in the business of arresting just anyone anyhow. He said all the Buhari administration does is to empower the security agencies and the anti-corruption agencies to do their jobs, without the administration trying to teleguide them. He also added that the fight against corruption in the country was not fought on ethnic, hasty or premediated grounds. “Corruption is not an ethnic thing, there is an equal representation in the stealing as no one operates with his/her ethnic group alone, the culprits are in every case seen so far, united by greed to steal and not by ethnic or religious interest,” he said. He frowned at a situation where for instance as much as $15 billion has disappeared from the national coffers into private pockets, saying no responsible government would wave that aside so as not to offend people. Mr. Osinbajo also said that security agencies in Nigeria have arrested about 800 suspected violent herdsmen across the country. 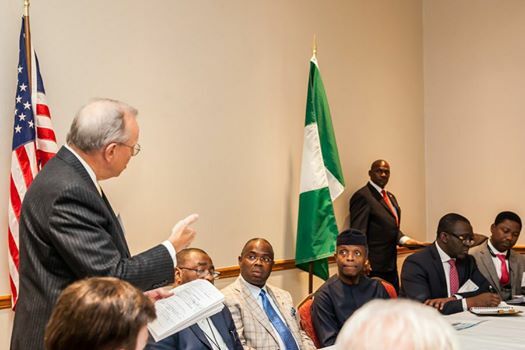 Mr. Osinbajo said this in Houston, Texas in the United States at a Townhall event where he interacted with U.S.-based Nigerians who asked questions live at the event and also via the internet, according to a statement issued by his spokesperson, Laolu Akande. The vice president fielded about 30 questions at a well attended townhall event moderated by Rudolf Okonkwo of Sahara Reporters and Nimi Wariboko of Boston University. Asked about the issue of Fulani Herdsmen attacks in certain states across the country and what the Federal Government was doing to curb the problem, the Mr. Osinbajo said “the President has given firm instructions to the security agencies to arrest not only herdsmen who are attacking communities anywhere in the country but anyone of them or anyone at all in possession of firearms”. He added that “there are about 800 of suspected violent herdsmen in the country that are currently in custody.” The vice president however decried the slow pace of the criminal justice system that affects the prompt trial of such suspects. Mr. Osinbajo reminded the audience however that the issue of killings by such violent herdsmen has been a perennial issue especially as grazing lands continue to disappear over the years and the cattle feed on peoples crops on the farmlands. He said that the matter just did not crop up when President Buhari assumed office. Vice President Osinbajo urged against the tendency of interpreting the herdsmen issue as a religious issue, stressing that it is important for all Nigerians to refuse such divisive narratives and tendencies. He reminded his audience that there has always been conflict between herdsmen and communities across the country and that people should disabuse the notion that the problem has just started because President Buhari, a Fulani, is currently at the helm of affairs in the country.